FBC Jax Watchdogs: Ooops!! Perry Noble's Tithing Gimmick Ends Up Cursing His Congregation! The silliness that these "pastors" engage in in "their" churches is beyond sad because each one of these "pastors" has a following and many church members will do what they are told to do by their "pastor". Sadly, these people are already cursed...by having Perry Noble as their "pastor". These mega-church pastors all use the same formula. I would just ask Perry Noble, how can you trust God to forgive all of your sins but not trust him that he will provide for the church without extracting money from people using a doctrine that is not part of the new covenant? I think these tithing sermons speak more to the lack of faith on the part of these preachers than anything else. You know Jax, I read this stuff and just become incensed. This is abuse. It's not even spiritual abuse as much as it is plain ole abuse. Yet these churches seem to be growing and thriving. Why are people attracted to churches that beat the heck out of them? I don't get it. These are tactics that cults use if you read about James Jones or David Kiresh or any other cult leader. People need to simply get up and walk out of these churches who teach curses or any other form of God's wrath that Christ paid for on the cross. This teaching goes against the passages of the widow who willingly gave her last money as well as God loves a cheerful giver. How typically tasteless of Perry Noble, to use the lingo of drug dealers in his teaching point. Really? A a "dime bag" refers to a $10 bag of marijuana. So, to follow on to his analogy, is Perry the dealer who supplies his sheep with an addicting substance from which they prove their wisdom by tithing from it to God? Perry is addicted-- to money and power. I've just about come to the conclusion that people enjoy being deceived. There is something about these celebrity, spiky-haired preachers that makes people want to open their wallets and check their brains at the door. Well, I'll tell you what it is. It's a seducing spirit. These preachers are as good at seducing the congregation as Hugh Hefner is with tempting men to look at the latest centerfold. What is the bogus need in a person's life that requires such foolishness? Are people so empty that they are willing to follow any new doctrine or any new trend that walks through the door? The fact that these "preachers" can attract hundreds and even thousands of people is a testament to the lost condition of this culture. It's the same reason that vulgarity reigns in Hollywood and why Grammy Award performances rooted in witchcraft are praised by the elite. "Every that shines is not gold.......and everything that blooms does not smell good!" - cynical enough to think his sheeple ere too stupid to notice. I took issue with him calling it a dime bag more than the illustration. I believe, however, that we are slightly misunderstanding his illustration. He was saying for every $1 you get you give a dime and i'll even give you the dollar and the tithe today. We can split hairs all day over the question was the $1 the increase or the $1.10, but I understand what he meant and i'm sure God knows the intent of their hearts in giving. I do, however, take issue with his application of the scriptures. He did imply that if you don't tithe you are cursed financially, etc, etc, etc. I don't believe this is for the church, yet pastors in churches all of the world are teaching this today. Yes, I personally need to give more, but not to escape the curse of God but because I wanna support the work of God and keep the lights on at my church. Debbie: I believe the reason these types of churches are growing is because of two reasons that come to my mind. People like to be told items are black and white and no gray. These people do not wish to use the brain that God gave them. I disagree Tom Parker on number two. People are so brain washed now from day one as a youth especially in churches like the SBC that they must tithe. I wonder if that is being taught now in the seminaries. The tithe. How to increase your money, how to get it....these guys are more concerned with money than saving souls. It's not just about the fact that they don't want to think. It's also about the fact that, when you have 14,000 members, you know that no one is going to notice if you don't attend, don't give, don't actively participate in missions and ministry. 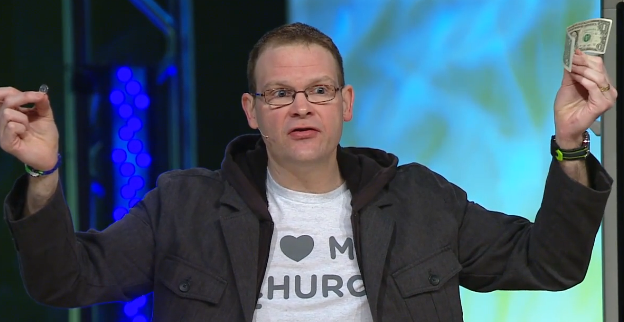 It's much easier to be a small part of a mass movement and do nothing but wear your "I Heart My Church" tshirt all over town. People love to point to all the "growth" as evidence of God's work. Let's keep in mind that many movements have growing followers that have nothing to do with God. And also that Jesus went from 5000 down to 11 during the course of His ministry. Josh B says: "We can split hairs all day over the question was the $1 the increase or the $1.10, but I understand what he meant and i'm sure God knows the intent of their hearts in giving." No sir, we mustn't let Perry off the hook so easily. He is the one that says a person must tithe off of the "increase", and that 10% is the standard, and to not give 10% of your increase is to set yourself up to be cursed by God. If that is true, then Perry was very careless to give church members $1.10 and tell them to give only a dime back as a tithe. But of course - we know that this is all just hocus pocus, and there are no curses or blessings based on a 10% cut give to a 501(c)3 organization. This just serves to prove that Perry himself doesn't believe his tithing nonsense, else he would have done the quick calculation himself. There will always be those who come along and attempt to sell us what we can have for free. "We can split hairs all day over the question was the $1 the increase or the $1.10, but I understand what he meant and i'm sure God knows the intent of their hearts in giving." So it's about the intent of the heart and not the letter of the law? I agree, but I don't think that Perry would agree with you. You can easily prove me wrong by providing a sermon clip of him promoting your philosophy. People are out there lost. And we continue to wander in the weeds of the tithing debate. These hirelings are greedy deceivers who love money and want to be wealthy. The people who follow them are the same, greedy and covetuous. This is why these organizations are flourishing They are businesses hiding under a cloak of not for profit decency, and a mask of religion; to avoid paying taxes. Actually the tithe of the OT was about 23 1/3%, so even a $.11 "tithe" would be "robbing God". Then, since he is telling his goats, er uh congregation, to follow laws to every jot and tittle he would need to have them follow all 613 laws of the OT. These hucksters like Noble have buildings full of false converts who must be kept in check by constantly hounding them with "you better not" and "you need to be" because the Holy Spirit is not present to convict them. These poor deceived souls are on their way to hell because Noble and his ilk are teaching a form of godliness, but denying the true and living God. Anon:11:26....you've hit the nail on the head....all we care about is whether the church's coffee shoppe now serves Sumatran or Kenyan coffee, and if I can schedule the racquetball court at 4pm in the family life building..
My understanding is that legally, if a charitable donor "earmarks" a charitable donation, i.e., specifies what particular purpose he/she wants the donation to go to, then the donee has to honor that earmark. So, for example, if you give money to your church but on the check you write, "to be used only for the youth ministry", the church has to abide by that earmark. This got me to thinking. I just wonder what would happen if all the members of these megachurches started earmarking their contributions for the ministries the church maintains to keep up appearances - you know, silly stuff like taking care of the needy and foreign missions (as an aside, I used to belong to a megachurch that had a "ministry" to the needy of the community. What it amounted to, every Thanksgiving IF the needy could somehow manage to get themselves to the church, they passed out these grocery sacks - 1 per family containing a whopping 25 bucks worth of canned food items and other cheap groceries). So, I wonder what would happen if Perry Noble's and Ronnie Floyd's congregation immediately began earmarking their tithes and offerings for the church's token needy relief ministry, foreign missions, international hunger relief, etc.? Now in all fairness, a church does need funds for basic things like a building, and clergymen do have families to support. So maybe earmark 10% of that tithe to "building and salaries"? Of course the sheep aren't going to do this because if they did, they would probably get a curse put on them the next Sunday. But I'd just love to be a fly on the wall at that rebuke sermon, to hear how Perry and Floyd and their ilk would ab(use) the Bible to explain the sheeps' disobedience in earmarking their tithes. "But I'd just love to be a fly on the wall at that rebuke sermon"
"Why are people attracted to churches that beat the heck out of them? I don't get it." The only thing I didn't do, which I do in the other churches, was to become a burden to you. Please forgive me for this wrong! I guess it's a case of: "mad believer disease," the greater the advantage taken, the greater the willingness to support! Now that's just funny right there! Why didn't he give them 10 dimes? Ouch! I guess that he figures he's going to get the whole $1.10 back most of the time. But here's the thing. Those folks didn't earn that $1.10. Sure, if someone gave me $1,000,000 I'd give my church $100,000.00. No problem. Maybe even $200,00.00. Actually a pretty easy decision if you think about it. But the money that you earn to support your wife and children? I'm not sure that I even understand the point that he's trying to make. Good grief. So technically you're wrong about Perry having bad math skills and leading his church to "rob God". If you were actually there the dime and the dollar were used for an example. He wasn't saying 10% of 1.10 is 10 cents. As a guide he was teaching us that for every dollar we bring back one dime to God. It's all Gods in the beginning anyways.